Aristotle was an Ancient Greek philosopher and polymath. Along with his teacher, Plato, he is one of the most important figures of the philosophical scene of the ancient world, and his musings transpired Western philosophical and scientific thought until the Industrial Revolution of the 17th century. Aristotle was born during the second half of 384 BC in ancient Stageira in Halkidiki. His father was the doctor of King Amyntas III of Macedon, who was the father of Phillip II and grandfather of Alexander the Great. Aristotle’s parents died when he was young and he was taken under the care of his father’s friend, Proxenos, who lived in Atarneus in Asia Minor opposite the island of Lesvos. When he was 17, he went to Athens to study at Plato’s Academy, where he stayed for 20 years, until his teacher’s death. With his friend Xenokratis, he left Athens and went back to Asia Minor at the court of their friend and fellow student, Hermias, who had become the tyrant of the area. Aristotle taught there for three years, and he managed to influence Hermias towards being a kinder and more righteous ruler. In 345 BC, he went to Mytilene, Lesvos, with his friend Theophrastus. He married the niece of Hermias, Pythias, with whom he had a daughter. Three years later, he was invited to the court of Phillip II, in order to teach his 13-year-old son, Alexander; the lessons took place in Pella and in Mieza, near modern Naousa. He stayed at the Macedonian court for six years; after Alexander crushed the Thebans, Aristotle returned to Athens and after his wife’s death, married a woman from Stageira and they had a son. He also founded his own school, Lyceum, between Lecabetus and Ilissos. It was during this time that Aristotle studied every subject possible; anatomy, astronomy, embryology, geography, geology, physics, zoology, philosophy, literature are just few of the subjects he studies and made considerable contributions towards the advancement of knowledge. He wrote over 400 books, most of which are unfortunately lost. In 323 BC, when the death of Alexander became known, supporters of the anti-Macedonian party thought that they could hurt Macedonians by punishing Aristotle. The clergy, led by hierophant Eurymedon, and Isocrates’ school, led by Demophilus, accused him of irreverence, because he had created an altar to Hermias. 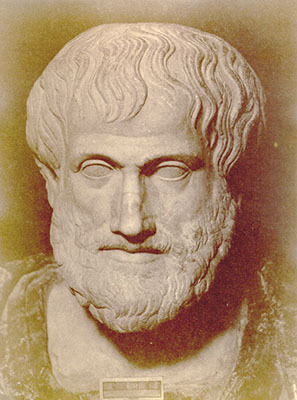 Aristotle understood the real motives of his accusers and fled the city before his trial started. Theophrastus became the director of his school, while he went to Halkida, where he stayed at his mother’s house, along with his second wife and his two children. He died between the first and the twenty second of October 322 BC because of a stomach disease, in sorrow and melancholy. His body was brought to Stageira where he was buried honorably. His compatriots constructed an altar on top of his grave, named one of the months Aristotelian, and held festivities in his memory, also named after him.